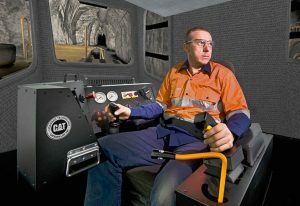 The Immersive Technologies simulator for training operators of Cat R1700G and R2900G underground loaders. INDONESIA – Freeport McMoRan (FMI) in Indonesia is using training simulators from Immersive Technologies to prepare operators for Caterpillar’s semi-autonomous load-haul-dump operations with Cat Command for Underground. Command for Underground automates the tramming and dumping component of an underground loader’s load-haul-dump cycle. The operator has the ability to control the machine from an office or remote location away from the hazards of the underground mine. One or more machines can be controlled at once, enhancing operator safety and optimizing production between multiple machines. In the past Command for Underground operators were required to have experience operating the LHD R1600G but with the training features of the Immersive Technologies simulator they are now able to train non-operators. The trainees are given 10 hours of classroom training followed by 20 hours in the LHD R1600G IM360 simulator. Upon completion they then complete further 20 hours of training within the Immersive Technologies’ Command for Underground simulator where they advance to practical training and evaluation. “The realism and functionality of our simulators at FMI had to be very authentic as many of the trainees had never been in an LHD. Trainees needed to build up basic operating skills before they could even begin Command for Underground training. The blended learning from our IM360 and Command for Underground simulators delivered a seamless training experience,” says Ravitha Sukumaran, product manager at Immersive Technologies. There is an Immersive Technologies simulator for almost all mining situations. Find yours at www.ImmersiveTechnologies.com.